“Nothing in life is more liberating than to fight for a cause larger than yourself, something that encompasses you but is not defined by your existence alone.” “Glory belongs to the act of being constant to something greater than yourself, to a cause, to your principles, to the people on whom you rely and who rely on you.” “America’s greatest strength has always been its hopeful vision of human progress.” Senator John McCain said those things and many other things that define him as having been a genuine fine human and a great American. Whether or not you agreed with his positions on important issues, he set an excellent example for public service that had at its center the Good of the Nation—a rare attitude these days. He said not to be discouraged by our present difficulties but to always believe in the promise and greatness of America. 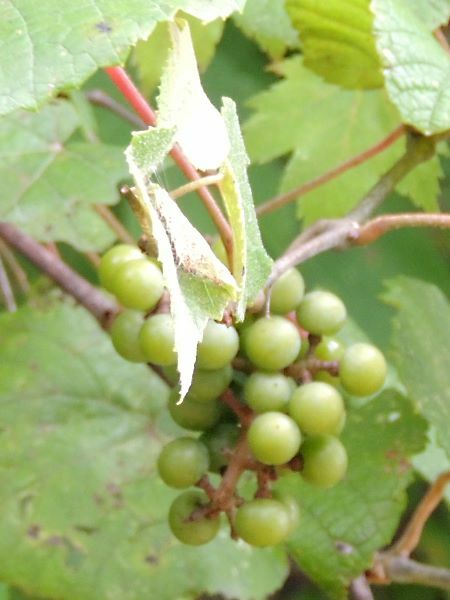 Sour grapes about Champion internet. 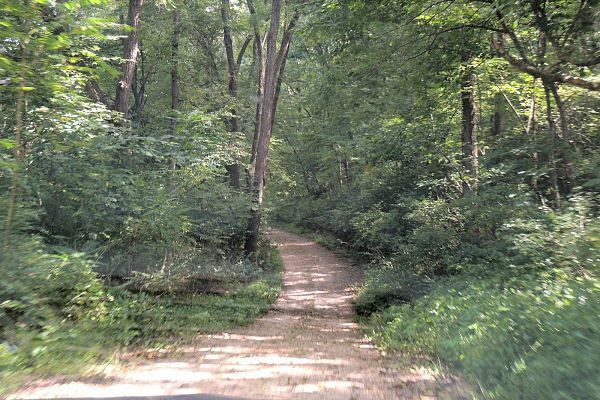 Pete, Frank and The General made a foray last Saturday into the Champion Township to answer a query that had come over the internet about the “Old Hicks Cemetery.” “I hear that it is overgrown and almost impossible to get to, with nothing there that indicates it is a cemetery. I think now it’s called “Proctor Cemetery.” By all accounts, it was a successful mission. The place was found and, presumably, a report made to the inquirer. The internet has been a superb resource for genealogical research, for all kinds of research, communication, entertainment and education, among other things. It turns out that there is not an abundance of the broadband in this stunning part of rural America. All of rural America could use a boost in this particular infrastructure. Of course, we old folks remember when there was no such thing. It was easy to become accustomed to the new technology and then to become dependent upon it. Location, location, location is a real estate mantra, but it must apply to high speed internet as well. It may be called ‘fraud’ if you sell something you do not have. The Century Link DSL call center in the Philippines has articulate, polite people who try their best to help, but it seems a lost cause. They have sold more service than they can provide. There is a rumor or a hope that the White River Electric Cooperative might become an internet provider. Some Champions are including a note with their monthly payment encouraging them to proceed in that direction with vigor. A note comes to The Champion News mailbox saying that the caterpillar mentioned last week was the black swallowtail caterpillar, not the spicebush butterfly caterpillar. They do resemble each other, though the spicebush butterfly caterpillar has an unusual, yet pleasant, aroma and is found on anise plants. See a picture of the pretty and voracious critter, the black swallowtail butterfly caterpillar; at www.championnews.us Esther Wrinkles once advised that a mistake is an opportunity to revisit an interesting subject. She may have suggested that an intentional error could be put to good use. She had a lot of good advice. She loved Champion and was one of the original organizers of The Champion School Reunion. It always happens the Saturday before Labor Day. There is a pot luck lunch and good visiting with old school mates, their families and friends. Bring your lawn chairs and come up-down-over for the fun. There may be rain, but it might be sunny for the 34th annual gathering. The Champion News website has pictures of the reunion going back to 2008, including a picture taken at the first reunion in 1984. There are some fine looking Champions in the bunch. The Labor Day Holiday is a creation of the labor movement and is dedicated to the social and economic achievements of American workers. We may forget the reason for the observance, but we are glad to have an opportunity to get together with family and friends. There is plenty to celebrate. Sunday will be a nice opportunity to wish a happy birthday to Vernon Upshaw. There is a party planned at the Vanzant Community Building from 2:00 to 4:00. That hardly seems long enough to commemorate 80 years! Bud Hutchison’s Memorial Trail Ride, a National Ride, will head up at the Foxtrotters Showgrounds at 10:00 a.m. Monday. Children will be back in school on Tuesday. Over at our great Skyline R2 School they are planning a Grandparents Day Event to be held at 2:00 p.m. on Friday, September 7th. There are many grandparents in the neighborhood whose grandchildren live far away. 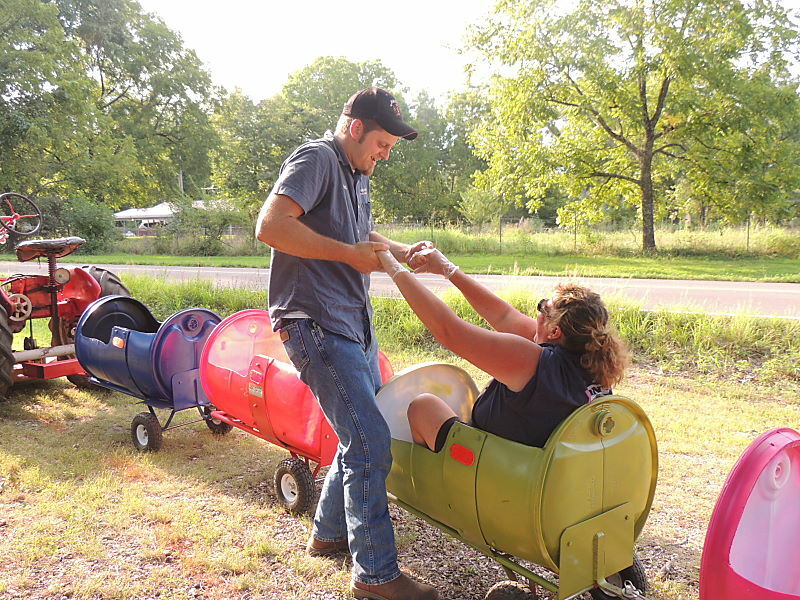 They are reminded of that old folk rock song, “If you can’t be with the one you love, love the one you’re with.” The young people in our terrific little school can use all the support and encouragement the community can give them. They are going to be running things before long—banks, farms, grocery stores, hospitals, car dealerships, government and everything we need to keep society functioning. Everyone benefits from a well-educated population capable of critical thinking. Go Tigers! 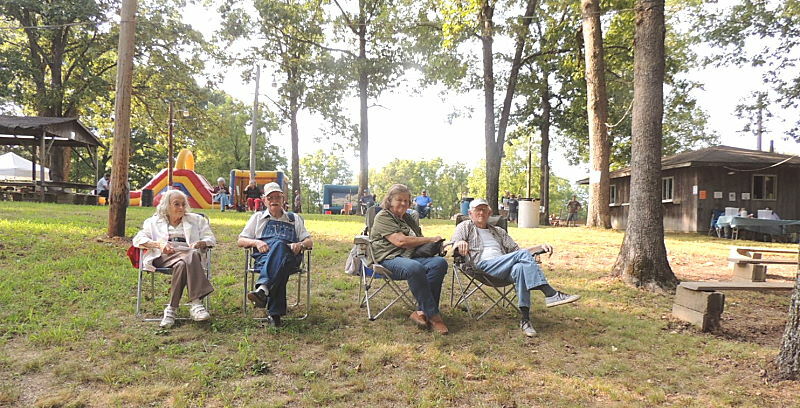 The Pioneer Heritage Festival of the Ozarks is coming up on the first week end in October. This is the second year for the event held at Chapel Grove over on 14 Highway at Bryant Creek. The wonderful Pioneer Descendant’s Gathering that Dale and Betty Thomas hosted down at Yates for 15 years has inspired this effort. It was a loss to the area when Dale and Betty felt like they could no longer do it, but the model they established is serving the new organization well. Sherry Bennett is looking for ten young people, 16 years or younger, who would like to participate in the Youth Stringed Instrument Talent Show which will be held from 2 to 3 p.m. on Saturday, October 6th. Contact Sherry at 417-543-1393 or 417-683-4414 to sign up. She says sign up early. Meanwhile, hopes are that a good slathering of Awesome Possum Salve is helping with her recovery from back surgery. She is much missed at the Vanzant Jam and many other places, no doubt. Jim Reeves, Eddie Arnold, Johnny Mathis, Perry Como and others sang a great song that her friends dedicate to her: “May the good Lord bless and keep you, whether near or far away. May you find that long awaited golden day today. May your troubles all be small ones and your fortunes ten times ten. May the good Lord bless and keep you ‘till we meet again” in Champion—Looking on the Bright Side! 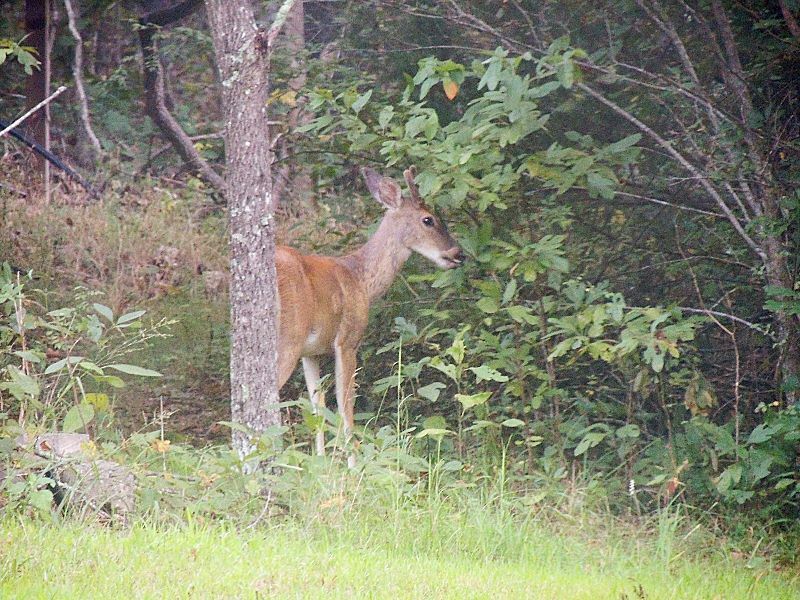 Young Champion buck enjoying sassafras. Champions get their US Postal Service mail at Rt. 72, Norwood, though it is being delivered from Mountain Grove these days by the lovely Karen Ross and her charming relief persons. Recently someone posted a photograph of Norwood on the internet. 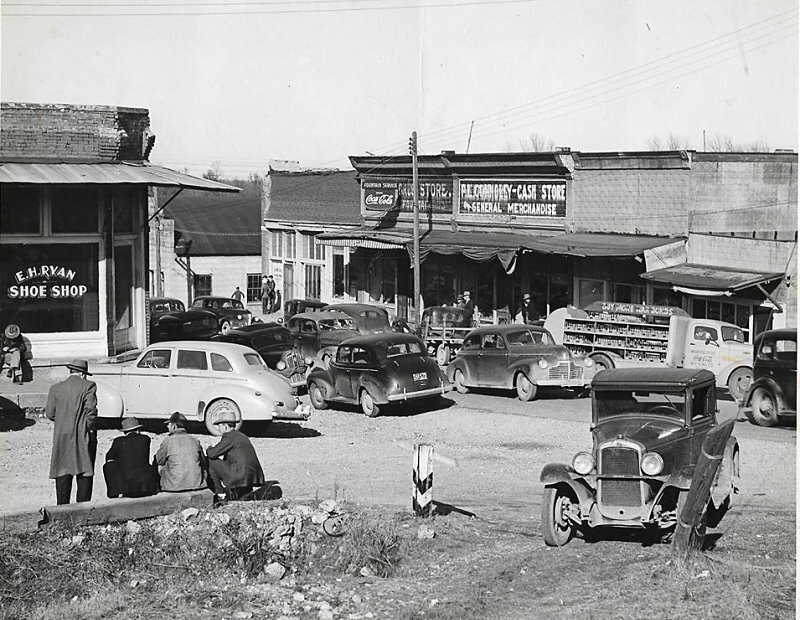 Judging by the vintage of the cars, the picture was taken somewhere in the 1940s. What a bustling place it was back then with its own newspaper, the Norwood Index, drug stores, banks, cafes, and other businesses. As late as the mid-1950s a person could get on a comfortable train there to go anywhere in the country. Times have changed and the nearest train station is now is 135 miles away. A few buildings from the old days still survive. The town is said to have been established in 1881, and named after a popular novel of the day, Norwood, by Henry Ward Beecher, brother of Harriet Beecher Stowe, written in 1868. It was 547 pages describing an idyllic New England town. A reviewer back then wrote, “to read through a novel so very long, so apparently interminable, and so amazingly dull as we are reluctantly constrained to consider Norwood to be, is a real triumph of endurance.” While it is not the robust place it used to be, it has a fine school, a post office still, and some very nice people. They will be having their 38th Annual Norwood Farmer’s Day on September 29th. 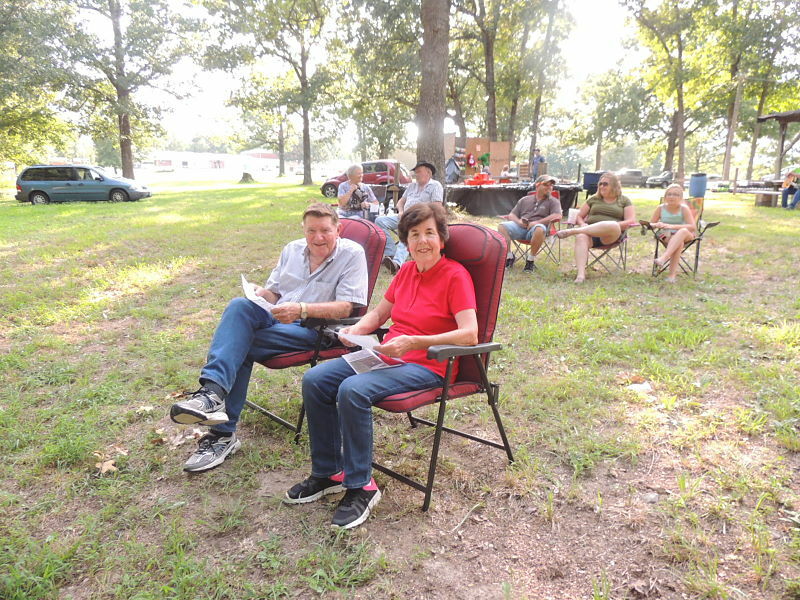 That will be after the Champion School Reunion, September 1st, Vernon Upshaw’s 80th birthday party in Vanzant (2:00 to 4:00 p.m.) on the 2nd, Bud Hutchison’s Memorial Trail Ride (from the Fox Trotters at 10:00 a.m.) on the 3rd, and then the Wall That Heals at the Fox Trotters facility September 20-23rd. 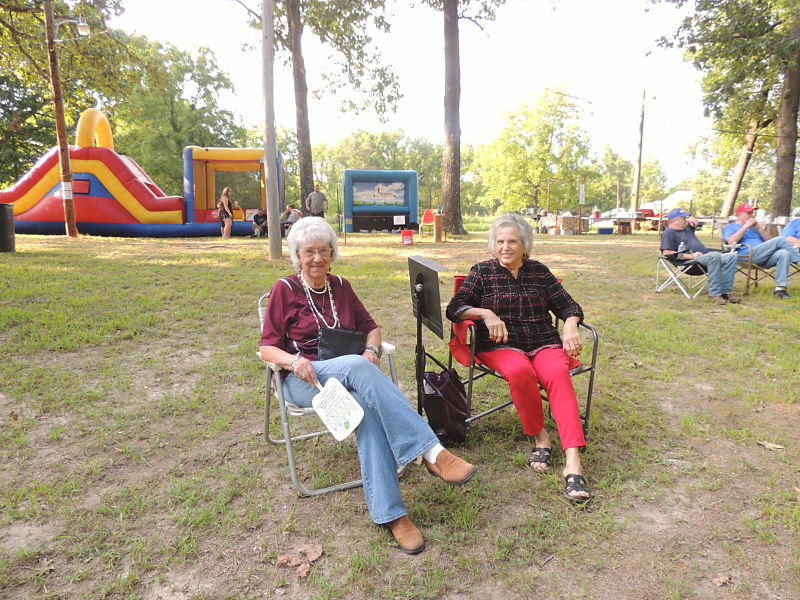 October is almost here and the Pioneer Heritage Festival of the Ozarks will take place the first week end. We appreciate our thriving local culture. Champion! Rain gauges, peach cans and buckets across Champion measured different amounts during the week past, but everyone agrees that the rain and now more moderate temperatures are most welcome. The difficulties of others across the country and across the world elicit our sympathy and keep us reminded that no one is exempt from the wild vicissitudes of weather on planet Earth. Hopes are that things will improve for our farmers and ranchers—the Champions who keep us fed. Nature is burgeoning all around. Deer are grazing in numbers, goldenrod is bristling up, little birds flash their colors, and spicebush butterfly caterpillars devour parsley while something unknown bores into pretty green tomatoes. It is hard on lawn equipment to mow when it is so wet, so some old folks are just watching the grass grow and thinking Wednesday might be a good day to get something done. 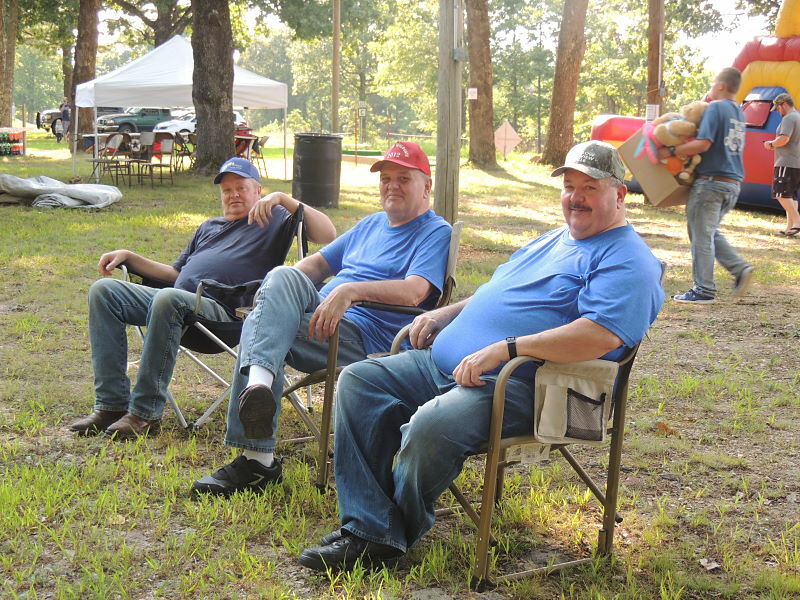 Skyline VFD Picnic pictures are up at www.championnews.us where The Champion News celebrates our great community. Click on the ‘more photos’ link and relive the fun. The Champion News also supports the wonderful First Amendment to the Constitution which guarantees freedom of the press. The free press has successfully served as a check on power for two hundred years. Like so much of our democracy, the freedom of the press is only as strong as we, the public, demand it to be and are willing to support. It is a Champion trait to be able to recognize baloney and cheese even in this Orwellian age. Douglas County Herald subscribers in the country are accustomed to getting the paper on Friday. When it did not arrive until Monday, some spent the week end wondering how different our rural communities would be without our local news. It is a valuable asset to be connected with our neighbors. Tianna Oglesby will have a happy birthday on August 22nd. Her nephew, Drayson Cline, will have his on the 23rd. Dakota Watts and Daniel Cohen live far apart and do not know each other, still they share a birthday on the 24th. Barbara Krider, Skyline sixth grader Dana Harden and prekindergarten student Lauren Collins all celebrate on the 25th. Rita Krider and Skyline first grader Haylee Odell share the 26th. Bill (Wes) Smith and Mini Jo Henson share their birthday on the 29th with Skyline students Rowdy Woods, seventh grade, and prekindergarten students Brantley Kilgore and Jason Smith. Laine Sutherland celebrates on the 30th which was also the birthday of the much missed Wayne Anderson. Kalyssa Wiseman and Jenna Brixey are fifth graders with the same birthday. Second grade student Ray Hurt joins them in celebrating on the 31st. Drayson and Carson Cline spent part of their wonderful summer with their “Grammie” in Champion. On the way back home to Tennessee, the travelers stopped in on Harley and Barbara Krider. Barbara is about to have a birthday and Harley is making a good recovery from some significant cardiovascular experiences. Reports are that he shows some wear but is also still showing his good attitude and good humor. He is driving again and is still volunteering at the hospital on the telephone. Their Champion friends are glad to know they are doing well. Most likely their spirits were much lifted by the family visit. Eleven guitars, three mandolins, two fiddles, a banjo, a bass and a couple of harmonicas made for a lovely Vanzant Bluegrass Jam on Thursday with great food, music, laughter and fellowship. Sherry Bennett sang her “Five Pounds of Possum” song to the delight of the big crowd. The next day she checked in to Cox South Hospital for a surgery to address a back issue. On Monday she was expecting to be released before long and said she still had pain, but just in different places. She is optimistic for a good outcome and so are all her friends, one of whom suggested a slathering of Possum Salve. Her sense of humor is intact and she can still pat her foot and music is always with her. It is unknown just when she will be back at the jam, but it is given that every heart will be happy when that happens. Beverly and Alvin Barnhart often come to the jam and they were there Thursday. They had been joined Wednesday afternoon by many friends and family at the Denlow Cemetery for the graveside service of their son, Alan. Loss is an inevitable part of life, and grief is a natural part of the healing process. At such a difficult time, Beverly reminds us to hug our children and dear ones and to tell them they are loved and to do it now while we can. “Have I told you lately that I love you? Can I tell you once again somehow? Dear, have I told you how with all my heart I do adore you? Well, darling, I’m telling you now.” Champion—Looking on the Bright Side! 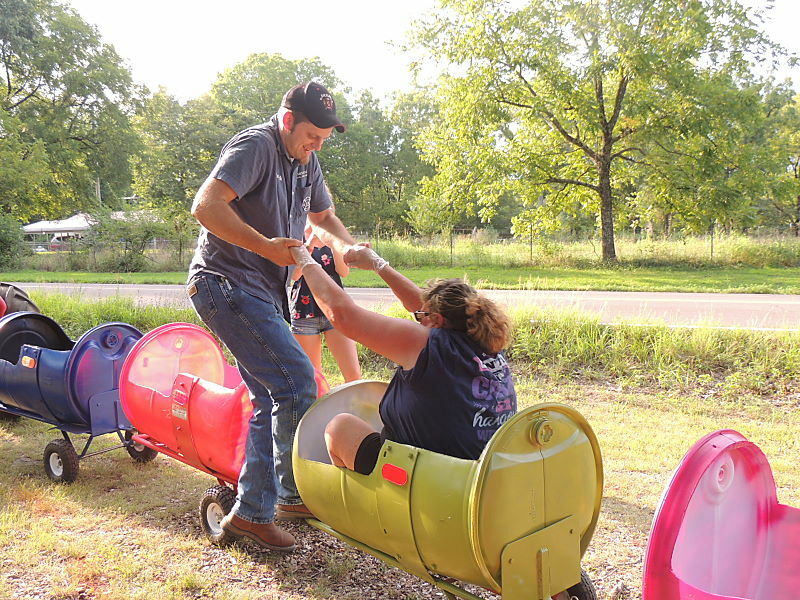 One driving by the Skyline VFD Picnic grounds on Sunday afternoon could hardly discern that anything had happened there at all. Everything is tidy and back to rights, thanks to the efforts of hardworking volunteers. It was a beautiful picnic. A few sprinkles on Friday night scarcely made a difference and Saturday night was warm and wonderful with a huge crowd. The music, the food, the prizes and games were all that we have grown to expect from this great event. 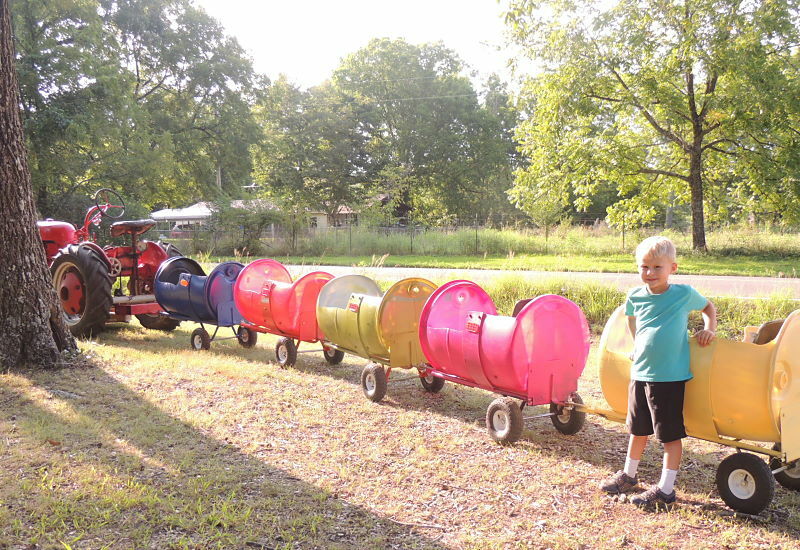 New to the picnic this year was a five car barrel train pulled by a Farmall Cub tractor. 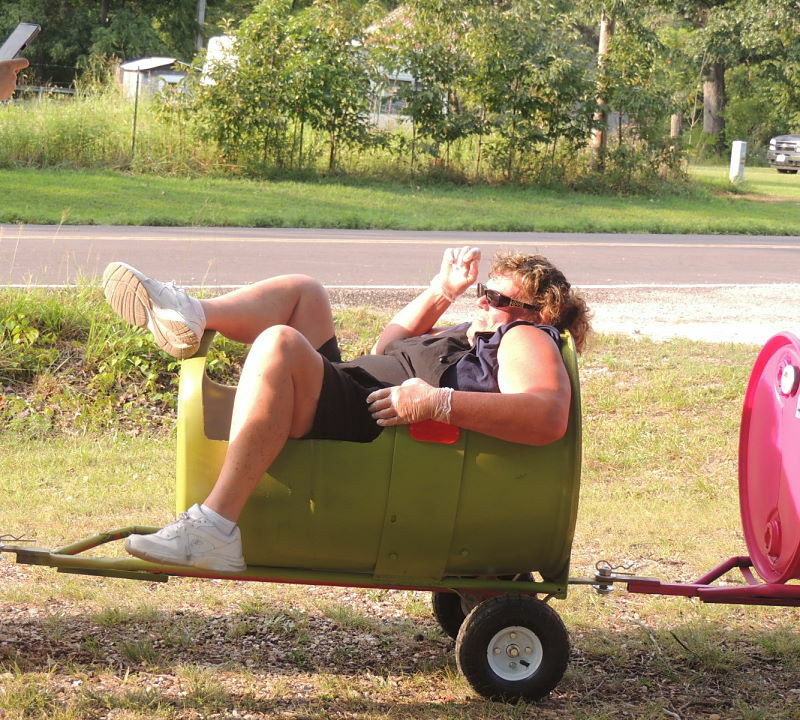 It rolled around the grounds all night carrying kids of all ages. Friday evening Brenda Coffman Massey tried it on for size and had to be prized out of a barrel and pulled to her feet by a brave young fire fighter. She was seen riding again Saturday night, apparently having learned how to get out without assistance. Brenda knows how to have fun and how to spread it around for every good cause. The Prominent Champion took the last tour of the evening, relaxing after all his hard work. The best thing about the picnic is having the chance to get together with friends and neighbors, many of whom we only see at this event. The community comes together to support the rural fire department that is vital for the safety of our property and our lives and the fire department hosts this gathering in support of the community. It is a symbiotic relationship—win-win. 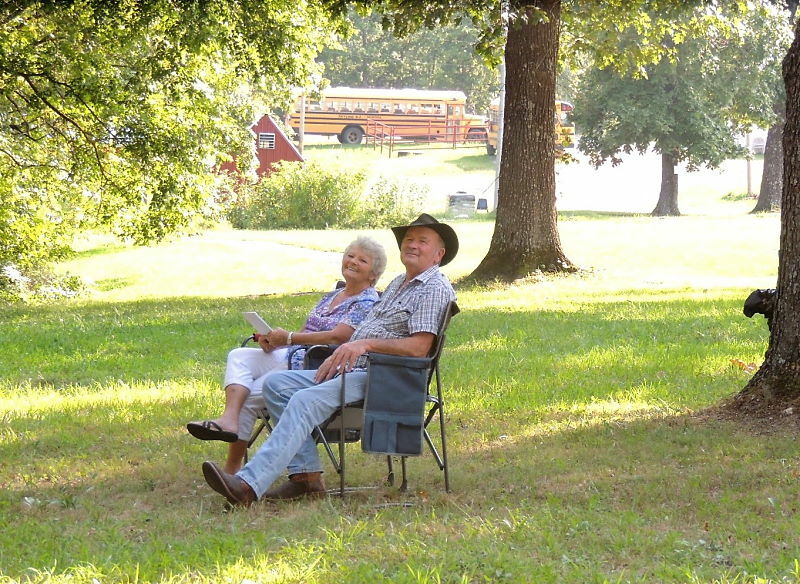 Darrell and Barbara Cooper celebrated their wedding anniversary at the picnic again. This year was their 46th. They had a good time and are planning a Wednesday trip to Champion one of these days when their schedule opens up. Barbara looks very much like her sweet mother and Darrell said she is just like Ruby, ready to go to the picnic at 3:00. The crowd sang that happy birthday song to Dean Upshaw again. His birthday is the 13th of August. He and his brothers are always some of the first to arrive. They set up their chairs to get a good view of the stage, but not too far from the concession stand. Andrew Hardin worked the P.A. system. He reported that Bud Hutchison’s Memorial Trail Ride will start at the Fox Trotters Showgrounds on September 3rd at 10:00 a.m. This is a National Trail Ride. Andrew said that Bud’s Champion Ride will take place toward the end of September. 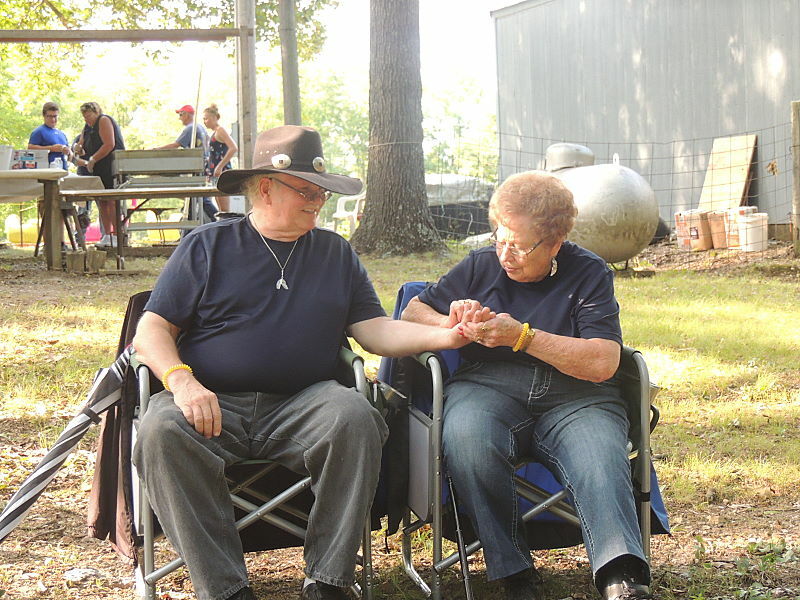 He also said that he is glad to know that Wilma is getting out and about and that she has become a regular attendee at the Vanzant Bluegrass Jam. He knows that music is as good for us as a good horse. The Champion School Reunion will be on September 1st, the Saturday before Labor Day. Nostalgia will rule as old school chums and their descendants gather together once more. They will come from far and wide: from Texas, Arkansas, and maybe Kansas, from Springfield and other places at the end of the great Champion Diaspora. They will bring pot luck dishes for a lunch (dinner) on the grounds and their lawn chairs to sit around and visit with one another, hopefully in the shade or at least on a mild afternoon. The Walk of Ages may take place in some permutation depending on the descendants of Ezra and Sylvia Henson. As the new year has begun for Skyline R2 School students, parents and grandparents are highly aware of the many benefits of our little rural school. It is one of the last such schools in the county. Our students will be coming together in future decades to remember this wonderful time in their lives. Though the world has changed a great deal since the Champion School was consolidated into Skyline, the children are the same—hungry for knowledge and the skills they will need for success in this age. Although many area residents do not have children or grandchildren in school here, they recognize that the future is in the hands of these young people. All of society benefits from a well-educated population and the community only stands to gain by supporting our little school, its teachers and staff. Champions all! On September 2nd Vernon Upshaw’s family will be throwing a party to celebrate his 80th birthday. It will take place at the Vanzant Community Building from 2:00 p.m. until 4:00. His younger brother says that everyone will be welcome. Perhaps he will provide his famous peanut butter ice cream along with the fun. This is a busy time of the year. The Wall That Heals is the Vietnam Veterans Memorial replica and mobile education center. 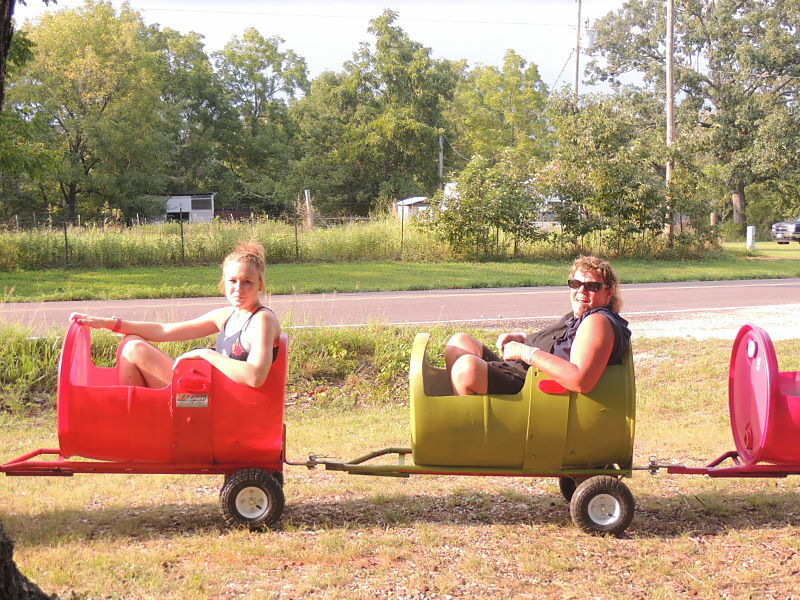 It will be on display at the Fox Trotters’ facility from September 20-23. This is a great opportunity to learn about a time that is so important to a great many Americans. 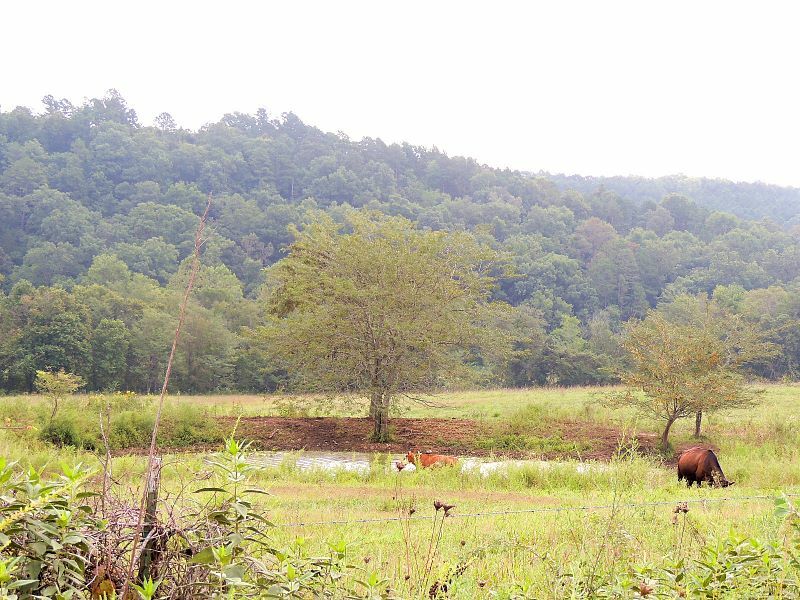 Thereafter, in early October, the Pioneer Heritage Festival of the Ozarks will take place over at Chapel Grove. There will be lots of good news about that as time draws nigh. This is a dynamic, happening part of the world. Friends gathered on Saturday afternoon to celebrate the life of Ronnie Yocum who passed away in early February this year. He did a lot of interesting living in 64 years and gathered many friends along the way. Those who became acquainted with him when he married Janice Lorrain in 2013 were sorry not to have known him longer and better. We knew that if he was OK with Janice, he was an OK kind of guy. He was into gardening, flying model airplanes and working on the cabin with Janice. Many public buildings in Ava have examples of his fine photography and graphic design skills in posters celebrating our pioneer heritage. He used black and white photos from the Historic Society as well as many of his own shots to remind us of our local past. The community will long and well remember him. Friends had stories to share—the kind of gathering he would have liked. The mailbox at champion@champion.us received a couple of interesting notes this week. One responding to an earlier article concerning the nature of truth quoted Abraham Lincoln who said all that the South wanted the North to do was to “Cease to call slavery wrong and join us in calling it right.” Another wrote in with the advice: “If you never heal from what hurt you…you’ll bleed on people who didn’t cut you.” It is something to ponder. There are reports that the weather has moderated to some degree in the west which is helping firefighters to make progress on controlling some of the devastating fires still burning there. While we have experienced some discomfort here this summer due to the hot, dry conditions, we are acutely aware of our good fortune over all. All across the country and all across the world there are people in much less desirable circumstances. An appropriate song for this situation is “Count your many blessings, name them one by one…” in Champion—Looking on the Bright Side! Upshaw brothers positioned early for the fun. Sherry Benet and John Webber–all smiles. 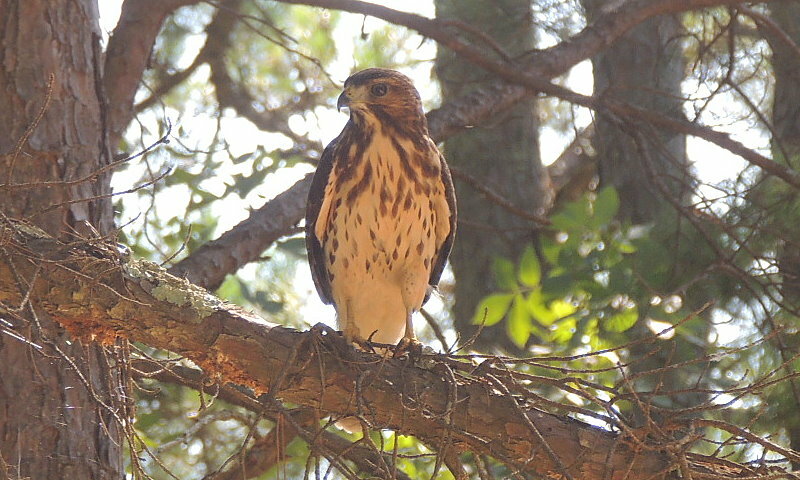 Pausing for a photo, a hawk on the way to Champion. Fires in the West and floods in the East make Champions glad to be Middle-Americans. There is plenty room for gratitude. Many are suffering across the country. We are at about the midpoint of summer and it has turned hot and dry. There are precautions to take in hot weather just as there are in winter. It is a good idea to have a hat in the car or a parasol in case you have to walk. Cell phones are good things if there is a signal. It is good to carry water with you, but not to leave it in a hot car. It is still green in Champion but the swirls of golden walnut leaves twirling down remind us summer is a swift season. Deer are out in numbers. On the way to Champion from any direction at any time of the day young deer can be seen browsing along the roadsides. They are beautiful to see and their numbers make venison aficionados optimistic for a full freezer this fall. Rabbits are frequently in the road in certain locations. 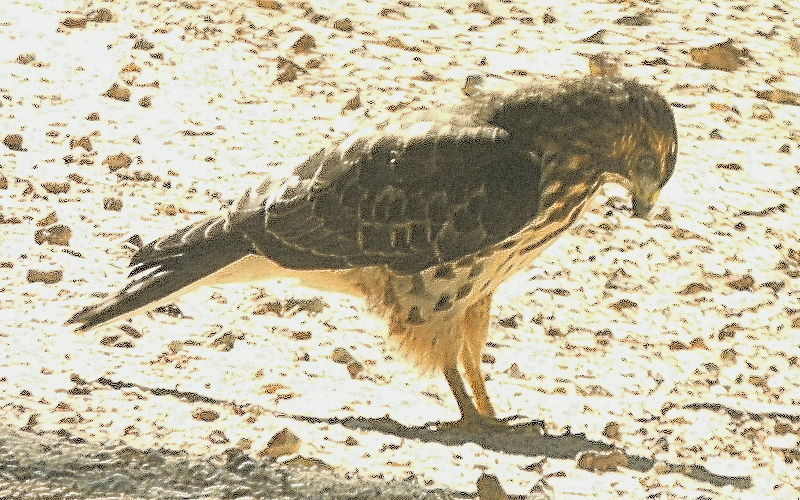 The presence of hawks keeps them undercover in other areas. Monday morning a small hawk was spotted in the road. 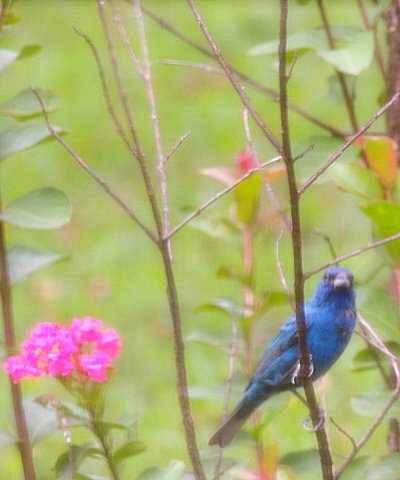 He paused to have his picture taken and then flew up into a tree for another pose. 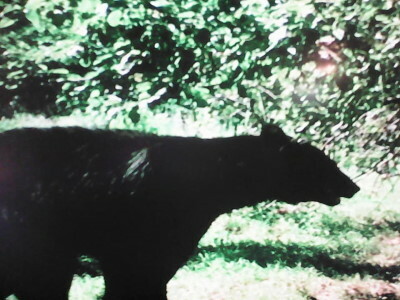 A few days ago friends over north of Brushy Knob took pictures with their game camera of the bear who comes to their apple tree every year. He is getting to be a big fellow. Champion wildlife makes this a great place to live. Caught on a game camera north of Brushy Knob. By the time this is in ink the primary election will have taken place and the votes will have been counted. The FCC Fairness Doctrine lasted from 1949 until 1987 when President Reagan made his judgment on the matter. The gist of the doctrine was to afford reasonable opportunity for the discussion of conflicting views on issues of public importance. Certainly it would have been a good thing to have had some clear conversation about “Right to Work.” Each side had figures and anecdotal evidence to support its point of view, though one side was significantly more elucidated around here. Go to www.championnews.us for alternate views, to add your two cents in the comment section, and to enjoy views of Champion with its School Reunions and Spring Flings. Share anything you like at champion@championnews.us or by the excellent US Postal Service at The Champion News, Rt. 72 Box 367, Norwood, MO 65717. Recently a supporter of The Champion News wrote in to explain the RICO Act. RICO is the abbreviation for Racketeer Influenced and Corrupt Organization. RICO crimes include money laundering, extortion, gambling, murder, bribery, securities fraud, dealing in obscene material, drug trafficking and embezzlement. “That’s how we got Al Capone,” the note said, but research shows that it was tax evasion that brought the mob boss down. Out on the wide veranda of the Recreation of the Historic Emporium a number of locals were discussing hay. They looked up at the field to the north and talked about how Larry Wrinkles had complained that the field was all up hill. Several of them were very familiar with that field. These fellows are old enough to remember bucking hay at a penny a bale. The Prominent Champion said that he and Lonnie Krider had hauled more than a thousand bales out of a field over by Gentryville and stacked it in the barn. He made $50.00 and thought he was rich. They speculated that there is probably not a young man in the country who would buck hay today for any amount of money and would likely not bend over to pick up a penny. MODOT workers spent a leisurely lunch break out on the veranda. They have been doing some nice work in the area. One old Champion told them how much she likes the white lines along the edge of the road. It is a good reference particularly as you meet someone who takes his half out of the middle. They said that those folks who drive down the middle probably pay higher taxes for their road use. School will be starting soon and teachers and staff are already getting ready for the arrival of our wonderful student body. Skyline School students with birthdays in August include third graders Caleb Harden, on the 5th; Jaycee Hall, on the 10th, Cryslynn Bradshaw on the 12th. John Brown is in the second grade. His birthday is on August 15th. Gina Hollingshad celebrates her birthday on August 6th. She has a beautiful voice and plays a variety of instruments. The 6th is also the special day for Lavon Carter over in Ava with her lovely smile. The 7th is for Bobby Three-Sticks. He is a Vietnam Veteran with a Bronze Star and a Purple Heart among other commendations. He is currently waging warfare against egregious venality and his Champion friends commend him for his sterling effort and wish him all success. At 50 now, a Wiseman claims to be the New Kid on the Block, as he considers he is now on the young end of old. Dean Upshaw knows all the words to all the songs that get sung at the Vanzant Jam. His birthday is on the 13th. His friends will be sure he gets celebrated Thursday evening. David Richardson was there last week talking about a band due to play at the Skyline VFD Picnic on the 10th and 11th. The name of the group is “Just a Few.” David is a funny guy and a great musical performer. He can be seen at any good cause anywhere in the area, particularly if there is music attached. 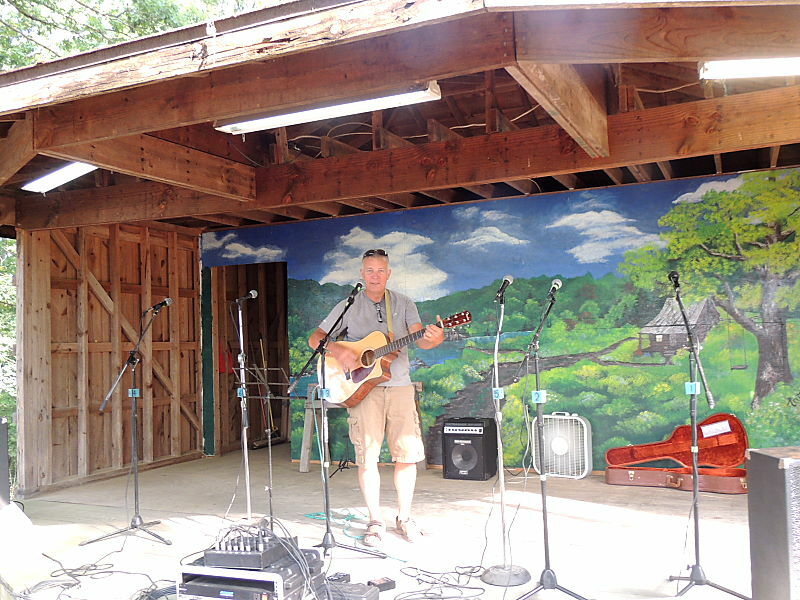 There will be great music attached to the Skyline VFD Picnic–the last of the summer picnics—the grand finale. The weather will be perfect. Volunteers have been getting things ready for the fun. This year the big prize is a 30 inch gas (propane) smoker. It is a Masterbuilt Signature Series by John McLemores. It features four big shelves and push button ignition. It will be a fine addition to a lucky person’s patio. Local merchants, who had already been approached for donations by any number of organizations, continue to share valuable items and services for door prizes. Last year a visiting cousin said that he could hardly believe that an event such as this could be held without armed security. He is from a big city and folks around here who met him are uniformly glad that he went back there or anywhere. Just like the old boy says, “Everybody’s got to be somewhere.” You are likely to run into people you have not seen since the picnic last year. Bring your lawn chairs. The Skyline VFD membership will be making cakes for the cake walk and pies for the concession stand. Perhaps David will sing, “I don’t need much, that ain’t no lie. Ain’t running any race. Just give me my country pie. I won’t throw it up in anybody’s face!” in Champion—Looking on the Bright Side!